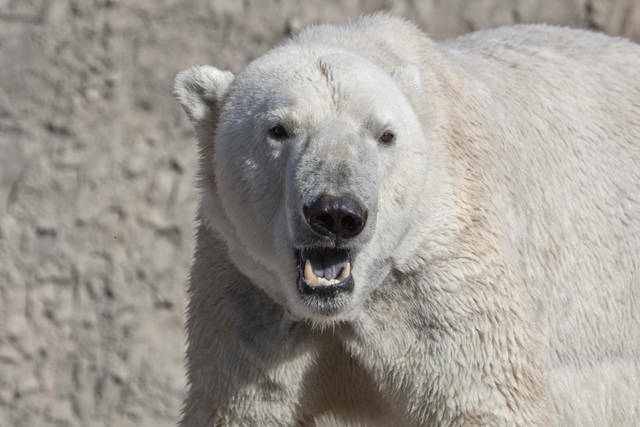 Powell, OH — The Columbus Zoo and Aquarium welcomes Lee, an 18-year-old male polar bear, who arrived from Denver Zoo recently. Lee’s primary keeper at Denver Zoo, along with a Columbus Zoo staff veterinarian, traveled with him, and animal care team members report that Lee is settling in well. The move was recommended as part of the Association of Zoos and Aquariums’ (AZA) Species Survival Plan® (SSP), a cooperatively managed program designed to maximize the genetic diversity and increase the population sustainability of threatened and endangered species in human care. Currently, there are less than 50 polar bears in North American zoos, and the species is facing increasing threats in their native range. Scientists have also noted that polar bears are generally solitary animals (with the exception of mothers with cubs and when males and females come together for breeding) and do not pair bond, but some individuals can still be more social than others. After completing a mandatory quarantine period upon his arrival, Lee will be introduced to 11-year-old twin sisters, Aurora and Anana. It is hoped that they will potentially breed in the future and produce offspring to benefit their species’ population as a whole. The Columbus Zoo has been successful in its polar bear breeding program with four surviving cubs born since the Zoo’s Polar Frontier region opened in 2010: Nora (female, born on Nov. 6, 2015 to mother, Aurora, and father, Nanuq, and now lives at Utah’s Hogle Zoo); Amelia Gray (female, born on Nov. 8, 2016 to mother, Anana, and father, Nanuq); and twins, Neva (female) and Nuniq (male), born on Nov. 14 to Aurora and Nanuq. At over 650 pounds, Nuniq already outweighed his mother at the time of his move to the Henry Vilas Zoo in Madison, Wis. in September. Amelia Gray and Neva moved to The Maryland Zoo in Baltimore in October. By moving the weaned bears to other AZA-accredited facilities as per SSP recommendations, this allows for the opportunity for Lee to be introduced to twin sisters, Anana and Aurora. Since the passing of Anana and Aurora’s former mate, Nanuq in 2017, this new breeding recommendation could potentially result in the births of cubs in the future. These births are important to the survival of this species, which in 2008, became the first species to be listed under the Endangered Species Act as threatened primarily due to climate change. “Lee is an extremely important ambassador for his threatened species, and we are proud to be a part of efforts to help sustain the polar bear population, raise public awareness, and support polar bear research in the Arctic. Together with our Central Ohio community and conservation partners, our Columbus Zoo and Aquarium team remains committed to making a positive difference for wildlife and wild places throughout the world,” said Columbus Zoo and Aquarium President and CEO Tom Stalf. Polar bears are native to the circumpolar north, including the United States (Alaska), Canada, Russia, Norway, and Denmark (Greenland). They are at the top of the Arctic food chain and primarily eat seals. Polar bear populations are declining due to the disappearance of sea ice, and experts estimate that only 20,000-25,000 polar bears are left in their native range. Some scientists believe if the warming trend continues, two-thirds of the polar bear population could disappear by the year 2050. The Columbus Zoo and Aquarium is dedicated to conserving polar bear populations in their native range. Since 2008, the Zoo has contributed more than $250,000 to research benefiting polar bears in the Arctic. The Zoo is also designated as an Arctic Ambassador Center by Polar Bears International (PBI). At the Columbus Zoo, visitors are encouraged to do their part to save this amazing species by turning off lights when leaving a room, minimizing their use of heating and cooling units, and other ways to reduce energy consumption. For the latest news about the Zoo’s polar bears, follow the Columbus Zoo on Facebook, Twitter and Instagram. For more information about the Columbus Zoo and Aquarium, please visit ColumbusZoo.org. Home to more than 10,000 animals representing over 600 species from around the globe, the Columbus Zoo and Aquarium leads and inspires by connecting people and wildlife. The Zoo complex is a recreational and education destination that includes the 22-acre Zoombezi Bay water park and 18-hole Safari Golf Course. The Columbus Zoo and Aquarium also manages The Wilds, a 10,000-acre conservation center and safari park located in southeastern Ohio. The Zoo is a regional attraction with global impact; annually contributing more than $4 million of privately raised funds to support conservation projects worldwide. A 501(c)(3) nonprofit organization, the Columbus Zoo has earned Charity Navigator’s prestigious 4-star rating.